I'm just going through one of those life phases where everyone is needing my energy. It set me up for a nasty stomach issue this week. I know that you know the kind of phase I mean. Anyway, I just felt completely useless yesterday. I kept trying to make myself do something productive, so I could feel good about my day. But came up short. I have a friend who tells me when I have these sort of days, to make a 2-do list. Not a to-do, but 2-do. Put two things on the list, and anything else that gets done is just gravy. So my 2-do list yesterday was to make dinner for 2 nights (so tonight's dinner prep would be easier, and give me time/energy to get other things done today), and catch up on laundry. 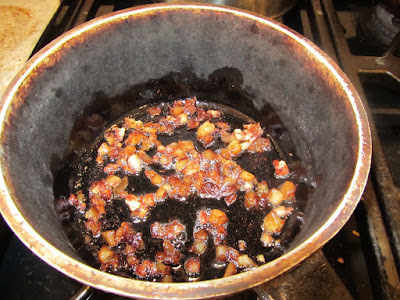 The "gravy" part yesterday included hot-gluing these acorn pieces together. Oak trees are not plentiful in our area, so when we come across acorns, we pick up both whole and pieces. I am working on my "collection" of acorns. 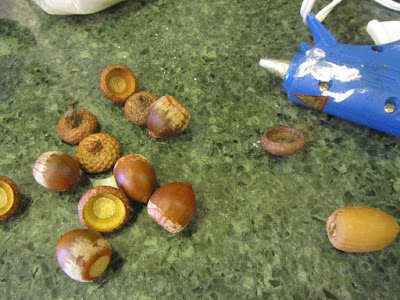 Jo Ann Fabrics sells decorative acorns for about $15, for a small box. That probably sounds ridiculous to some of you. But for me, that really is tempting. I imagine a large bowl of acorns on the coffee table in the family room. Or a tall, clear vase filled with acorns on the table in the entry way. Or, apothecary jars filled with acorns on a shelf in the living room. 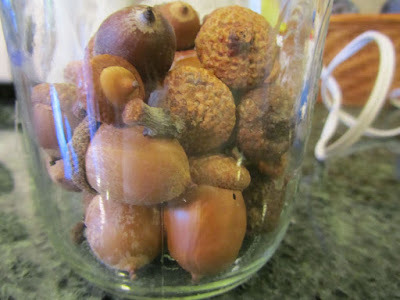 For now, I have barely a 1-pint jar of acorns. So, I'll work on my "collection" first, then do something decorative with them. I'm hoping today is a lot more productive. My stomach issues are abating. I slept long, last night. Yes, today should feel much more productive. Hope life is calming down for you! I like your friend's "2-do" idea. Very wise. Sometimes I make myself figure out what is essential and what isn't--it's so easy to get caught up in the "I should ... " parts of life! I didn't realize that oak trees are rare in your area. Acorns are pretty and fun for fall decorating. Enjoy! my husband says that the soil and weather conditions are not favorable for oaks, here. So then I wonder, why are there so many squirrels in our area? Don't squirrels squirrel-away acorns for winter? I've been using the 2-do list all week. No need to make myself feel guilty for not getting more things done. Your standards are pretty high IMHO, so I think your family and home can afford less effort and attention from you when you need recharging. They will love to give you that gift of time and space I'm sure. If you need a break from blogging, likewise, we would love to give you that gift too. Well, staying on top of finances is a pretty big job in itself! So, I'd say, on top of work outside the home, adding in financial stuff, you're doing a lot everyday. I do take at least 1 week off every year. I've made it a priority for my own well-being for the last few years. Thank you for the hugs and prayers. I did take time out to read a novel this week, and that took me away to another time and place, which was very rejuvenating. When I'm stressed over family member's health or issues, taking my mind someplace else for a few hours or a day or two is what really helps me. So sorry you have been ill. Sounds very smart to take it easy for a bit. Wish I could trade you some oak trees for some pines, lol. We have loads of post oaks here where I hike (in a national wildlife refuge or else I'd pick you up some acorns). I miss pine trees sometimes. Your wildlife refuge sounds wonderful for hiking! Wish I could trade you some pine cones for acorns. Thanks for the well-wishes! My stomach is doing better today. I hope you are feeling better. 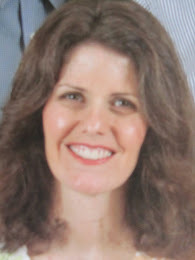 I am pretty new to your blog, but I believe that all your children are adults, right? I hope they are doing their fair share as part of living in your home as adults. They should be cooking dinner for YOU when you are not feeling well! Thank you. I am feeling better today. My daughters, especially, are very helpful. But I think you're right, especially when I have something contagious, someone else in the family really ought to be doing the cooking! For their own sake, if not mine! Hi, I will be lifting you up in prayer. I pray strength, comfort, wisdom and a refreshing in Jesus name. Thank you, Patti. I truly appreciate prayers. Take care of yourself, Lili. Let the grownup kids do their own thing for a day or two. I would even scratch the 2-do list and do nothing while you need to recover. I told my family I would be busy tonight until 8:30 pm and that I was not in a position to make any kind of dinner. Hubby said that we could just go without! He changed his mind about 10 am this morning and said he would put together a tater tot casserole and have it in the timer oven to begin cooking at 3 pm (he leaves at 2 pm) so that when I get home at 4 pm it would be ready. That way I could eat before heading out to my next commitment. So, see, no one is going without tonight because somebody stepped in to take control! What a good hubby you have to put together a casserole for all of you!!! You have such a busy, busy schedule, I am sure that was very appreciated! And you're right, there's enough self-interest in all of us, that someone will step in and make something, if not for any other reason than they want to eat, themselves! I think stomach illnesses are the worst. I'm glad that it is abating. You are such a goal oriented person, I'm sure it's been hard for you to be forced to slow down. Maybe it's a sign. Who knows? In the meantime the "Two do" list is a good idea. I've actually been continuing with a two-do list for the last week and a half. I do get more done than just the two items, but this is helping me to prioritize. In a few weeks I could make you acorn happy. Oak trees are everywhere here. I like the idea of a 2-do list. I need that for days like today when my day gets kidnapped by others. Oh, lucky you! I love the look of acorns as decor! What we do have in numbers here, is pinecones. Next season, I am all set! Sorry to hear you have been having such a rushed time lately. I'm glad to hear your stomach issues are starting to feel better, stomach issues are such a hard thing to deal with. Thank you. I'm doing better now. Just another reminder that I need to take care of myself, especially when life is stressful.